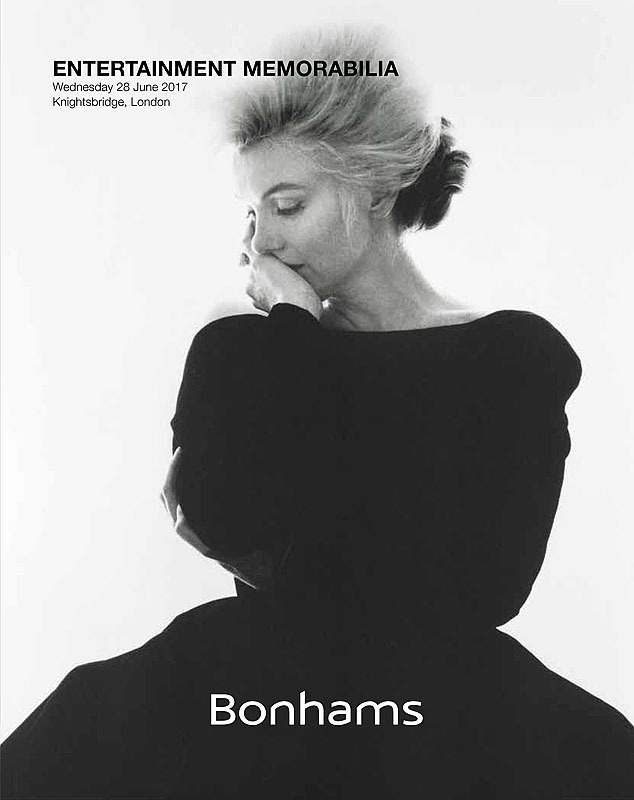 It’s that time of year when Bonhams hold their Winter Entertainment auction, and there are a number of quite nice items for sale - IF you have deep pockets!!! Doctor Who: a full-size silver coloured Dalek ('Mk 3', 1965-1969) constructed for use in various BBCTV episodes, screen-used 1960's version constructed circa 1990. Principally constructed in fibreglass (with metal, plastic and wooden elements) in five sections, comprising (1) wheelbase (2) skirt section (3) 'shoulder' section (4) neck 'bin' with embrasure frame and (5) dome, painted matt silver overall with black, blue and polished silver elements, including: approx 10cm trolley wheels countersunk into the black wooden base which underpins the fibreglass skirt, blue fibreglass hemispheres bolted onto that matt silver skirt (which includes an internal wooden bench seat for the operator), polished aluminium mesh and slats on the blue 'shoulder' section, a three-tier silver plastic manipulator arm with rubber 'sucker' cap, a polished metal gun-stick and rods, wooden neck bin covered in matt black metal mesh with silver embrasure in wood and fibreglass, the silver fibreglass dome featuring a metal and plastic eyestalk with blue plastic rings and illuminating black eyeball, and opaque dome light-covers, height approximately 60 inches (153cm). This 'vintage-style' Dalek was built in 1990 to the original BBC specifications for both charity display and BBC use. Notably, in 1993, it joined the line-up in the (now iconic) Doctor Who 30th Anniversary homage to the 1964 image of Daleks On Westminster Bridge. Later that year it made its first television appearance on BBC 2 in the drama reconstruction sequences of the BBCTV anniversary documentary Thirty Years In The TARDIS. After further use in a number of BBC shows and events - including those marking the millennium (BBC 2's 'Doctor Who Night') and the 2003 Doctor Who 40th Anniversary (Longleat) – it joined the 'Dalek Evolution' display at the Doctor Who Experience in both London (Olympia) and Cardiff (Porth Teigr). 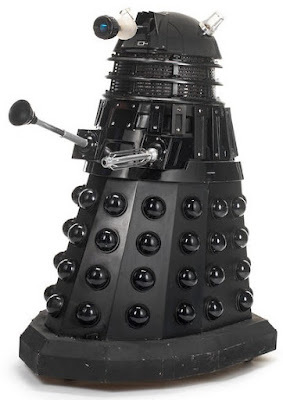 The Dalek made its first screen appearance in Doctor Who itself in the Series 7 episode Asylum Of The Daleks (TX 01/09/2012: BBC 1) and returned for both The Magician's Apprentice and The Witch's Familiar in Series 9 (TX 19/09/2015: BBC 1 & 26/09/2015: BBC 1 respectively). During the first of those episodes, the Doctor (Matt Smith), Amy (Karen Gillan) and Rory (Arthur Darville) were kidnapped by the Daleks and sent to their 'asylum' planet to prevent a break-out by the unstable Daleks imprisoned there. It was then that the Doctor met the first of the manifold Clara Oswalds (Jenna Coleman) created during the events leading up to the series' 50th Anniversary. In the latter episodes, the next Doctor (Peter Capaldi) - accompanied by Clara and "Missy" (Michelle Gomez) - was summoned to the Daleks' home planet, Skaro, for one last visit to their creator, Davros, who seemed to be dying. This turned out to be a sophisticated ruse to enable Davros to drain the Doctor of his regenerative power, but proved insufficient to fool him. As on so many previous occasions, the Doctor turned the tables on both Davros and his Daleks, and defeated them. Please note: Intellectual property rights and Trade Marks of the BBC/Terry Nation estate require that this screen-used item must be used for personal home display only; any and all commercial use is expressly prohibited. Please note: This is a large item so will go to offsite storage after the sale. 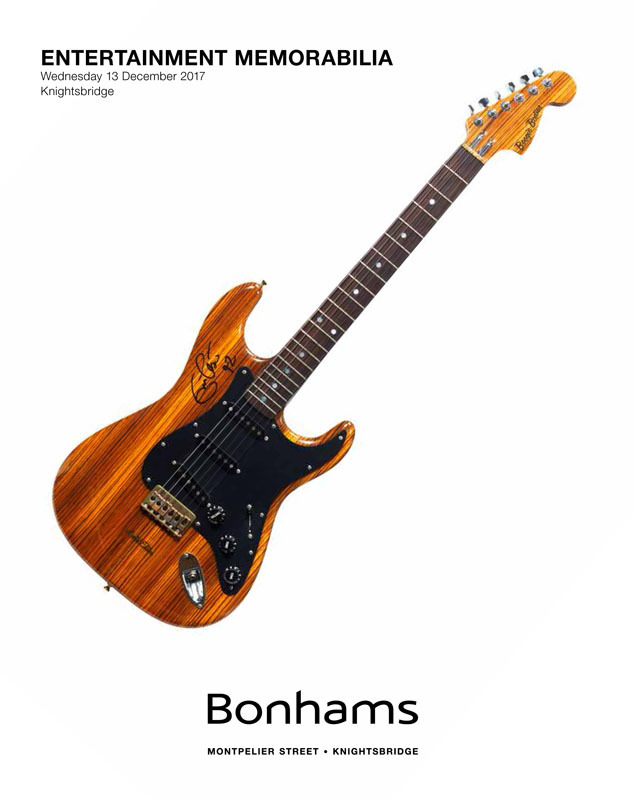 There’s only one Doctor Who item for sale in this month’s Bonhams Entertainment auction, but it is something of a landmark. 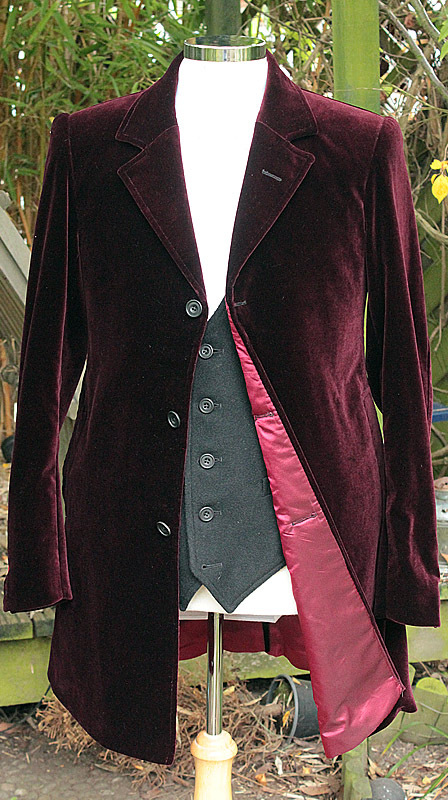 If I’m right, this will be the first lot relating to the Twelfth Doctor’s era. 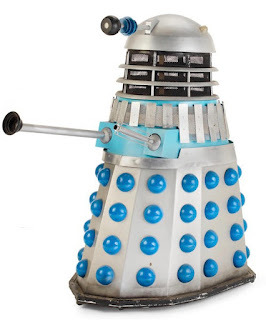 This Dalek was originally for charity display use, but subsequently appeared in "Asylum Of The Daleks" (TX 01/09/2012 on BBC-1) and "The Magician's Apprentice/The Witch's Familiar" (TX 19/09/2015 & 26/09/2015 on BBC-1). During the first of these episodes, the Doctor (Matt Smith), Amy (Karen Gillan) and Rory (Arthur Darville) were kidnapped by the Daleks and sent to their 'asylum' planet to head off a break-out of the unstable Daleks imprisoned there. It was there that the Doctor met the first of the manifold Clara Oswalds (Jenna Coleman) created during the events leading up to the series 50th Anniversary. 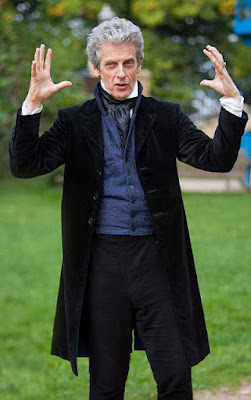 In the latter episodes, the next Doctor (Peter Capaldi) - accompanied by Clara and "Missy" (Michelle Gomez) - was summoned to Skaro (the Daleks' home planet) for one last visit to their creator, Davros, who seemed to be on the brink of death. This proved to be a sophisticated ruse to enable Davros to drain the Doctor of his regenerative power, but was insufficient to fool him. As has happened on so many previous occasions, the Doctor turned the tables and defeated him. Most recently, the Dalek appeared in the Cardiff Bay segment of the 2017 "Comic Relief" Television Appeal. 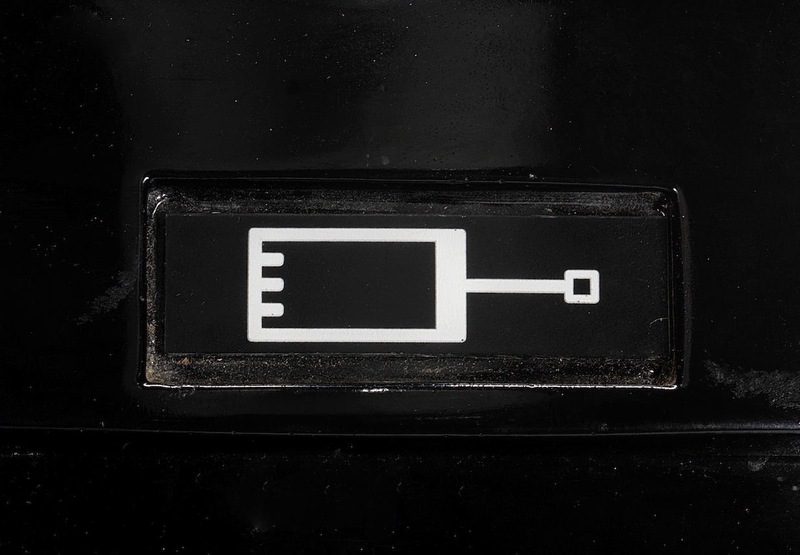 Intellectual property rights and Trade Marks of the BBC/Terry Nation Estate require that this screen-used item must be used for personal home display only; any and all commercial use is prohibited expressly. Filming on series 10 continues a pace, and Peter has been seen on location wearing a variety of new costume pieces in varying combinations. The one for me that catches the eye the most is a Victorian-style ensemble in range of quality silk and velvet fabrics. 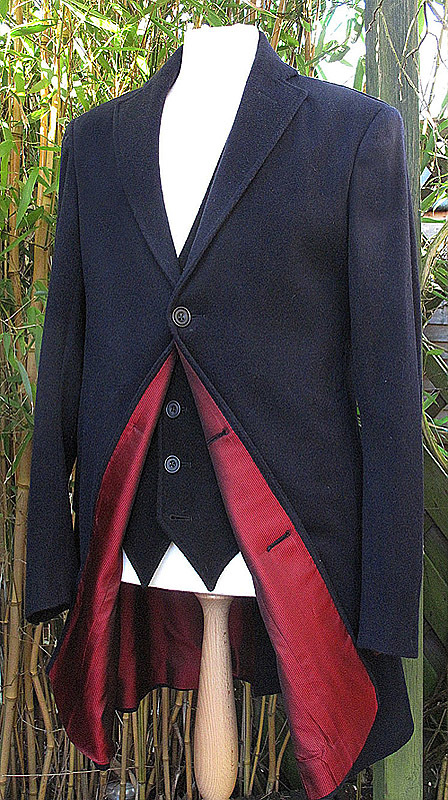 The coat, in black velvet with a light blue lining, is a strange semi frock coat cut with revere lapels. Underneath is a even older period-style royal blue brocade waistcoat with a distinctive stand-up collar. I’m already working on my version of the coat, but in the meantime I’m going to have a quick go at the waistcoat. 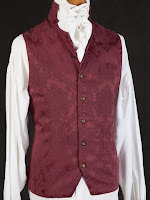 The cut, with the stand-up collar is a little unusual and does not feature in any of my vintage pattern books, but I did find an image of a similar garment online for reference. Interestingly it’s also made from a very similar fabric. 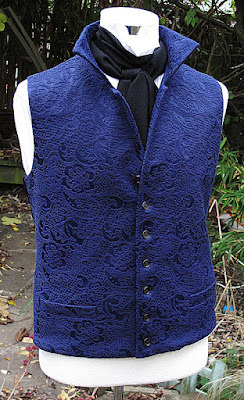 I devised my own pattern, using a basic waistcoat for the body and working a set in collar until I got the right shape. It came out surprisingly small in the end. 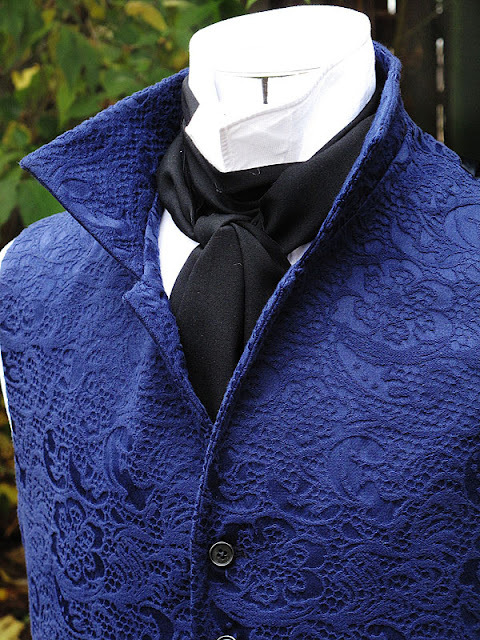 The fabric for Peter’s waistcoat, I gather, came from a shop in Soho called Misan Fabrics, but there was only ever a limited supply which since it was bought for Doctor Who, has long since gone. 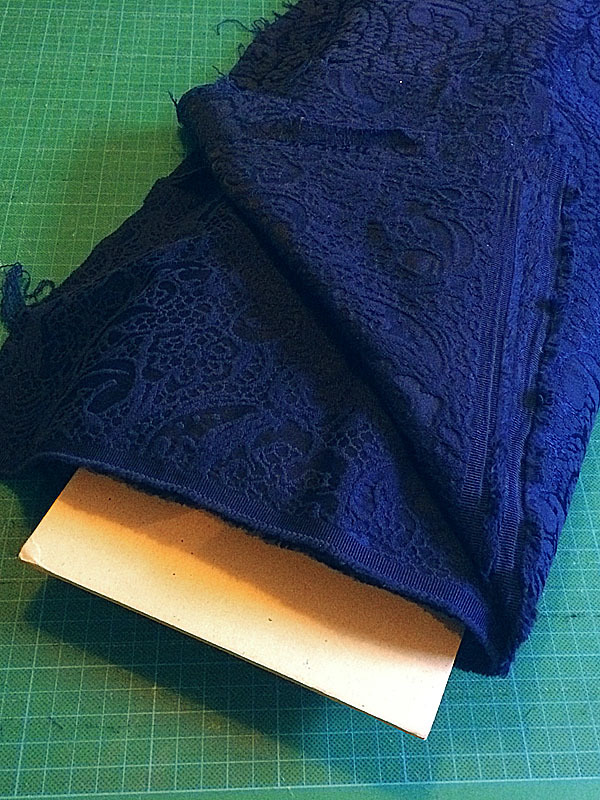 However, just down the road at another shop often frequented by the Doctor Who costume designers, I stumbled upon a fabric you’d be forgiven for mistaking for the screen-used stuff. 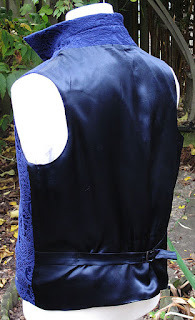 I had fully worked up the waistcoat on calico before cutting the brocade cloth, so it was a simple job to apply what I had learnt to the finished prototype. The pockets are very straight forward - just a horizontal welt, so I was able to use pattern cutting I had done for other garments here without any adaption. Some of my prototype is guesswork for now, so I have just used a simple navy blue satin for the back. No point over complicating things we I don’t need to. Since I had the fabric, the next thing to do was track down the buttons I’d need. They aren’t anything real special - just a small back plastic 4-hole button with a narrow rim. 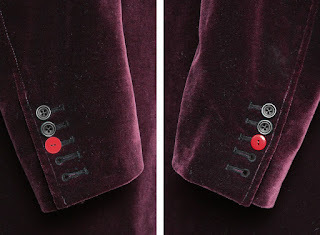 The buttons for the accompanying coat had come from The Cloth House on Berwick Street in London’s Soho, so I figured that was worth a look. It didn’t take more than a minute to find them, and looking at them they are the right ones - screen-used! The best part about buying them was getting the little calico drawstring bag with the shop’s initials on it! I’d love to hear what you think of the waistcoat it’s been quite a fun little project to do. Here are some great shots of one of my clients wearing his new burgundy velvet series nine coat I made for him. He took them at a castle near where he lives, giving it a feel of Heaven Sent, one of his favourite episodes. 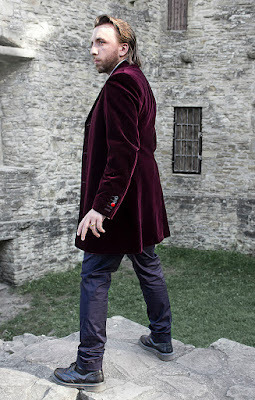 One of my clients has been out with his camera getting some great photos in his new burgundy velvet coat I made him. 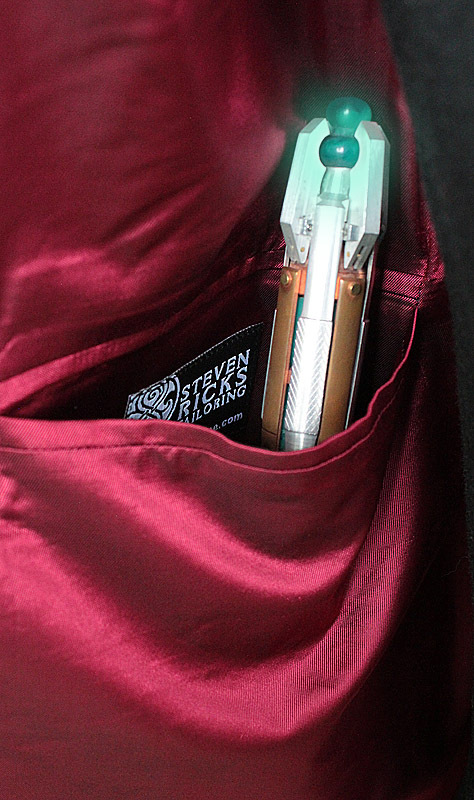 I’ll be posting the full pictures on Sunday evening, but for now, here’s a little teaser to whet your appetite. 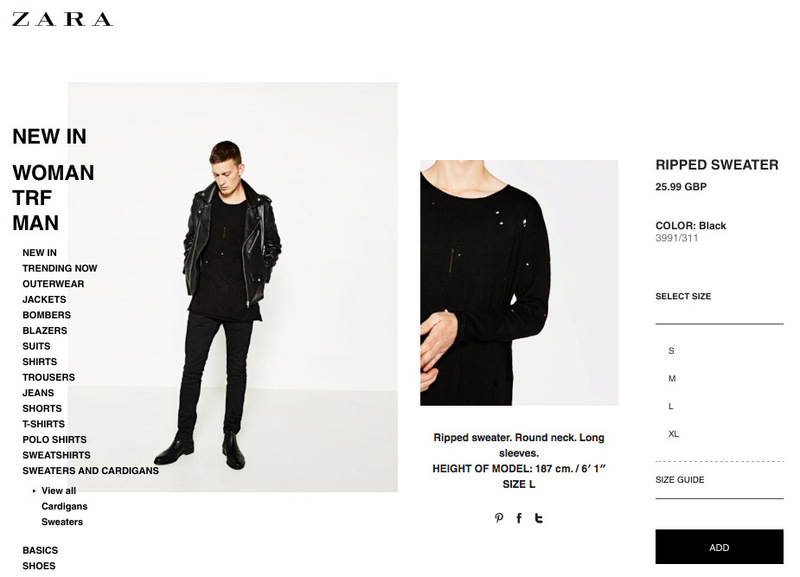 ZARA Ripped sweater - don’t rip a rip-off! 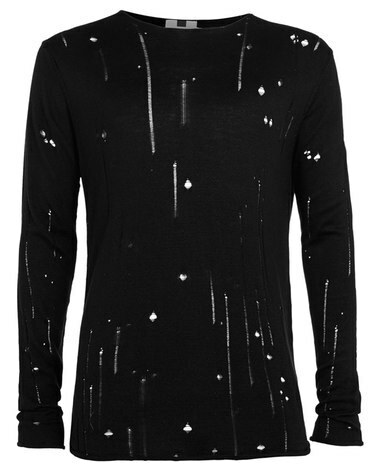 For those that missed out on the Paul Smith holy jumper, they had an extra life with the TopMan Laddered Crew Neck, which itself became canon in series 10. 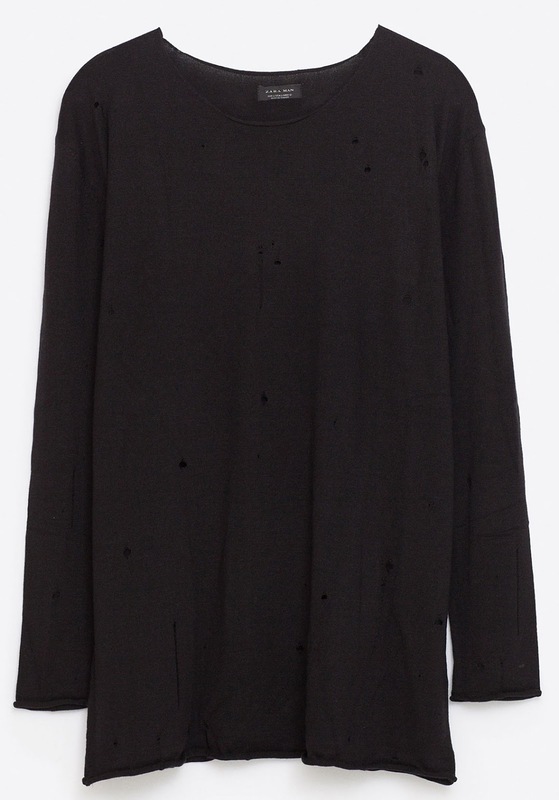 Now that that has sold out too, there is another life-line - in the form a a Rpped Sweater from high street retailer, Zara. 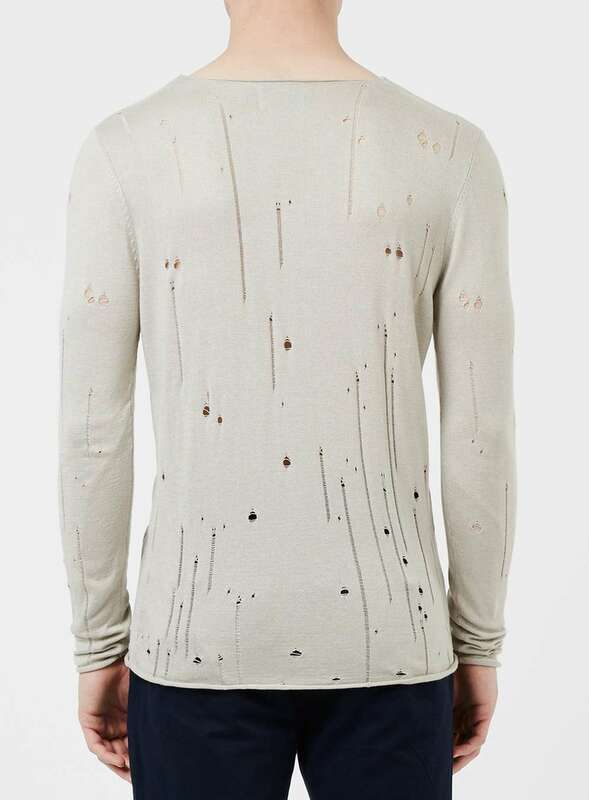 As you can see, it has the same style of holes and some ladders, but not as prolific as the Topman jumper, or the Paul Smith before it. 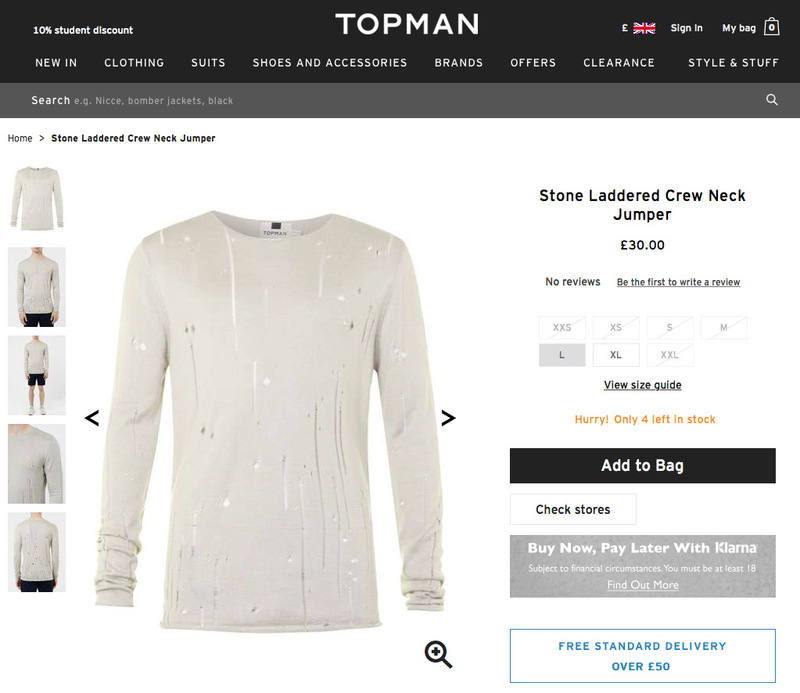 The overall shape a cut of the jumper is near identical to the Topman version, so in that regard it is a good stand-by while you track down a Topman screen-accurate version. 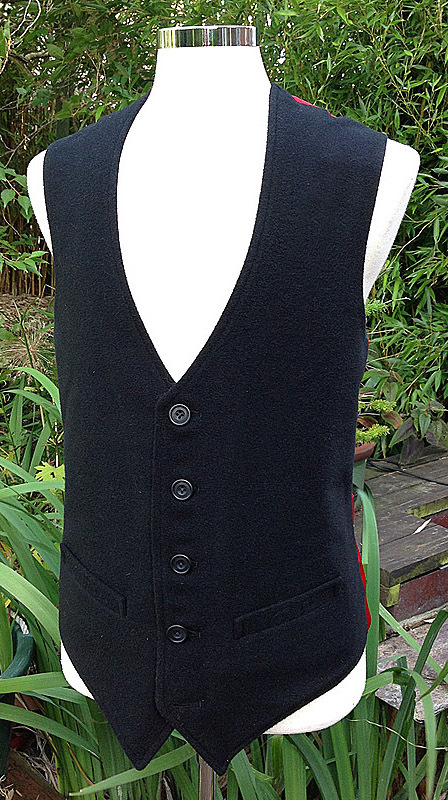 Given the availability of the preceding jumpers, this may be a good-enough alternative for the casual cosplayer. 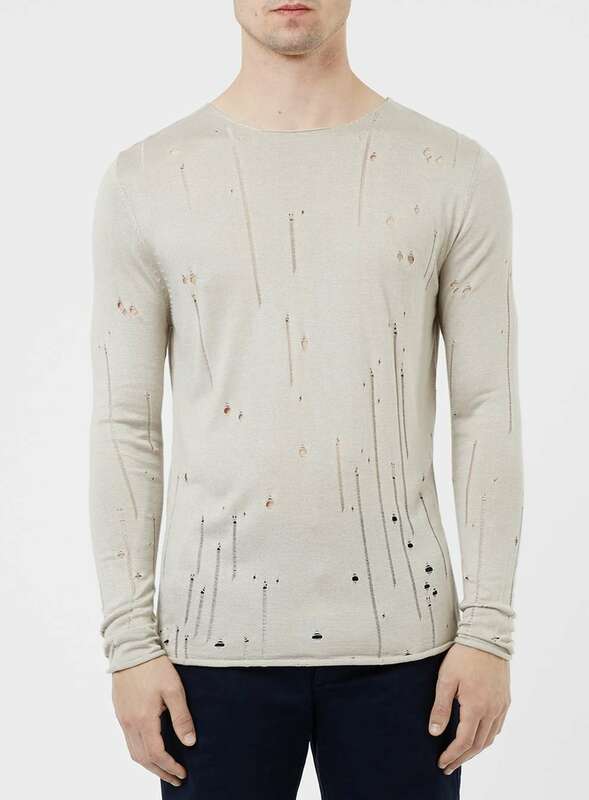 It is, however, slight cheaper than the Topman jumper - and radically cheaper than the Paul Smith - which is always a good thing for the wallet! This week I delivered a rather nice example of my replica burgundy velvet Capaldi coat. 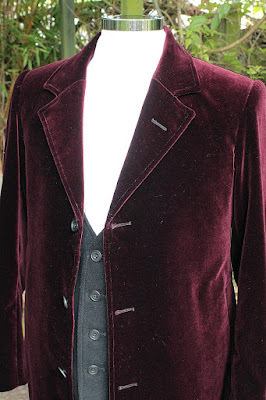 The client really wanted to all out on getting the coat made as absolutely authentic as possible, so he provided his own screen-accurate Holland & Sherry velvet, as well as the correct shot twill lining. The screen-used cloth is not the cheapest option when it comes to velvet, so can add nearly half the price to the cost of making the coat. The buttons are again the screen-accurate real horn, with the matt red cuff button from the original shop ray Holman got his from. My client provided his own shiny button for the other cuff. This client is a chest 38, so it snugly fits my mannequin, showing of the fit and cut to its absolute best. The problem sometimes can be making a coat to fit a client, and still keeping true to the appearance and proportions of the original we are trying to replicate. A taller frame will inevitable elongate the coat; a more stocky frame will widen the silhouette of the garment.Thus neither will look right seen out of context, but on the wearer they are cut for, the fit will carry off the look wanted. 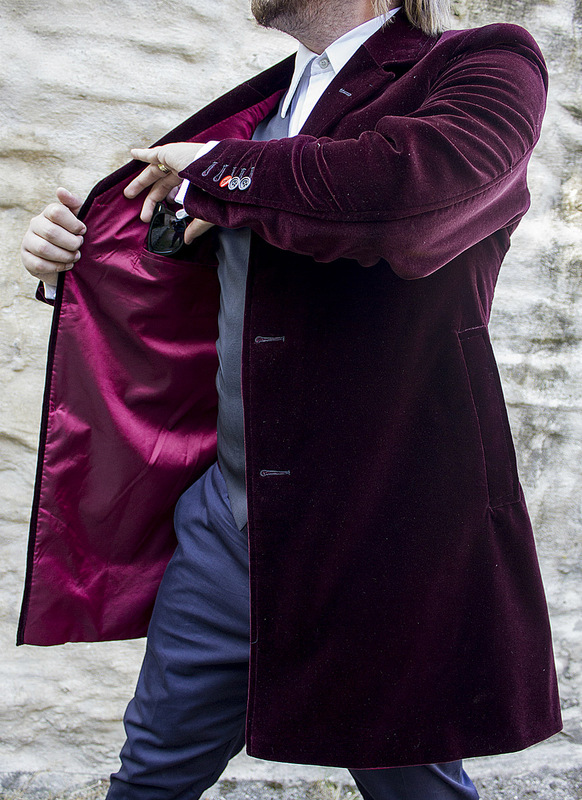 I don’t specifically know Peter Capaldi’s size, but this particular coat certainly feels to be the closest I have made to his fit. 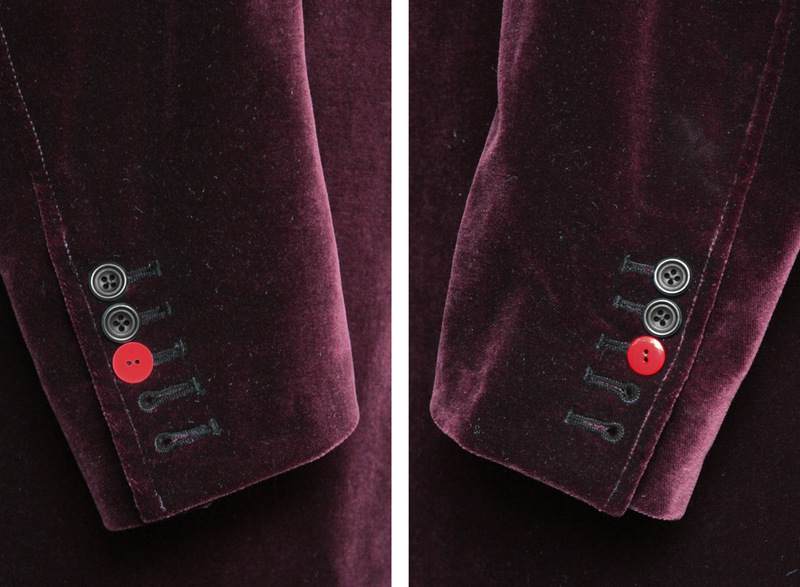 This means the proportion of the lapels and button placements can be their nearest to the screen-worn coats so far. 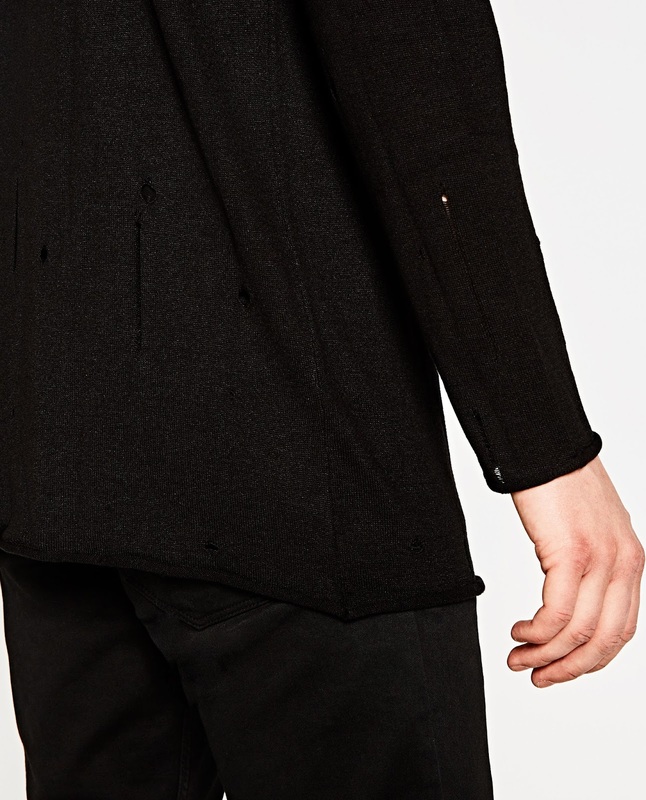 Keeping a good drape on the front of the coat where the lining comes right to the leading edge is deceptively challenging. 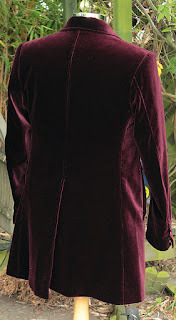 The coat was sent out to the client this week, and arrived safely the next day at its intended destination. 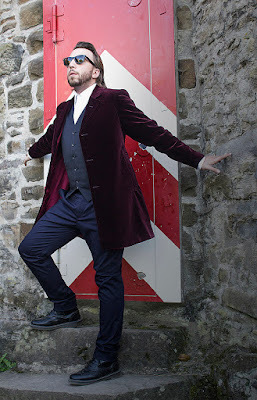 To say the client was happy is an underestimation - he’s been posting his photos to much praise on Facebook and Instagram ever since, with a photo-shoot planned at a castle very shortly. I’ll bring you the results from that as soon as I can. 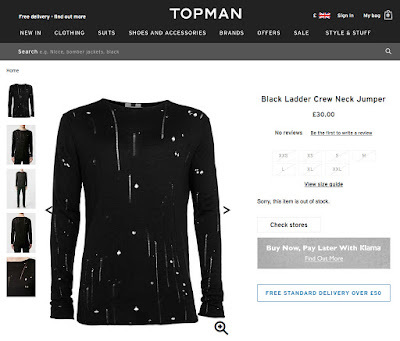 As per usual, it looks like the last of the BLACK Ladder Crew Neck Jumpers from Topman are now sold old, both online and in-store. Personally I came across a stone colourway in their Hemel Hempstead store, and at the time I saw it they were still available online. 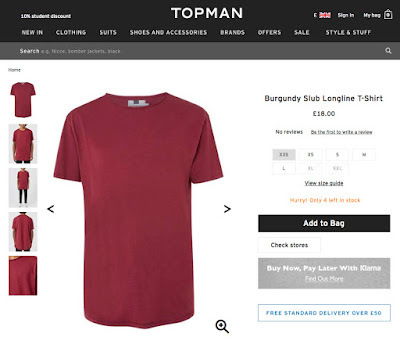 No link I’m afraid, by the time I got to write this, they had gone and Topman had removed the page. 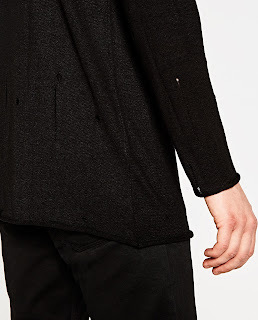 But while the page was up I did download the detail shots of the jumper for reference. What I will say is that having seen a number of the jumpers together at the same time, the holes and laddering are 100% consistent between jumpers. that is to say they are identically placed and shaped - probably knitted in as a pattern, and are not randomly applied during manufacture - ie by some mangle that distresses the jumpers on the fly. 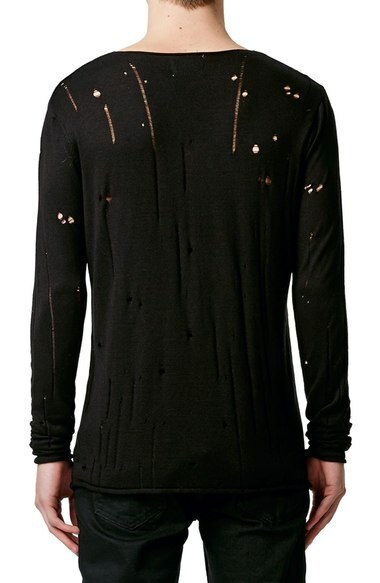 So although the jumper in this posting is most definitely not the right colourway, I thin the photos show the holes and ladders to a higher level of detail than the images of the black version. 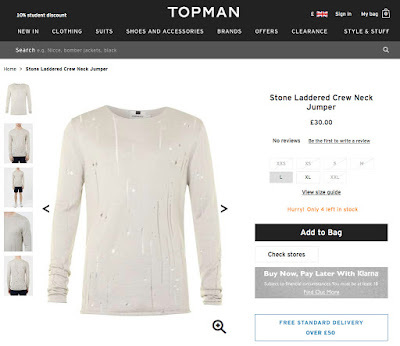 You can see the holes and ladders towards the bottom of the jumper a lot clearer in the stone version. 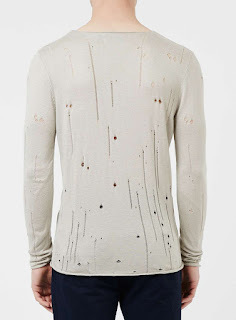 Having taken some professional advise, one final point - it should be noted that the jumpers are made of 50% Acrylic 50% Viscose, rather than the high-end wool used to make the Paul Smith jumper which these are somewhat of a rip-off of. This means they will NOT take to dyes - the acrylic content will just shrug the dye off, no matter what type you use. So please don’t buy one of these light coloured jumpers thinking you can dye it to black - it just won’t work. 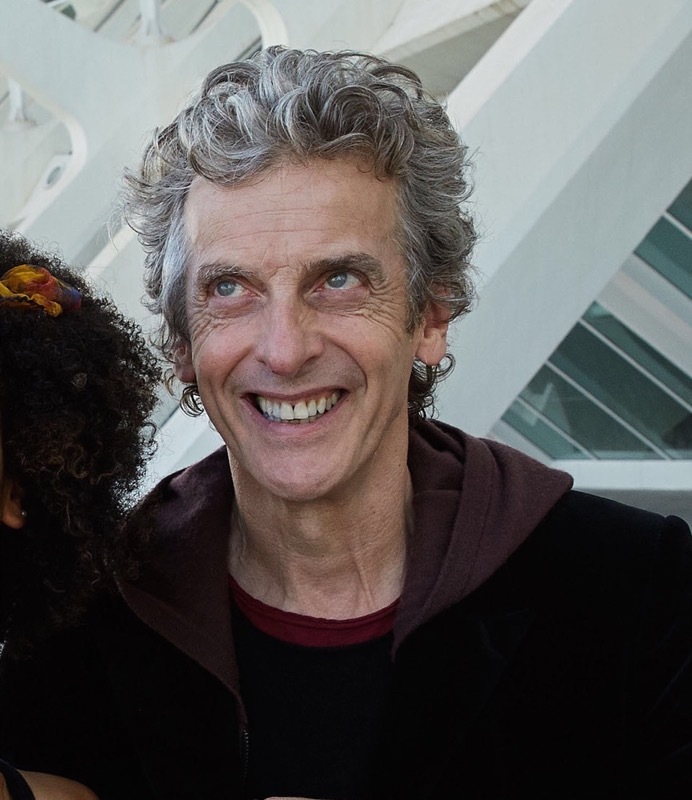 Opinion online seems to be that the dark red t-shirt at the bottom of Peter’s look for the Valencia filming is, like the jumper, from Topman. They seem to still be available on the Topman website, and presumably inistore. As ever, catch them while you can! Before the images disappear from the internet forever, I thought I’d share with you the official detailed views of the new Moth Distressed jumper Peter is wearing for series ten. Here is the back of the jumper. 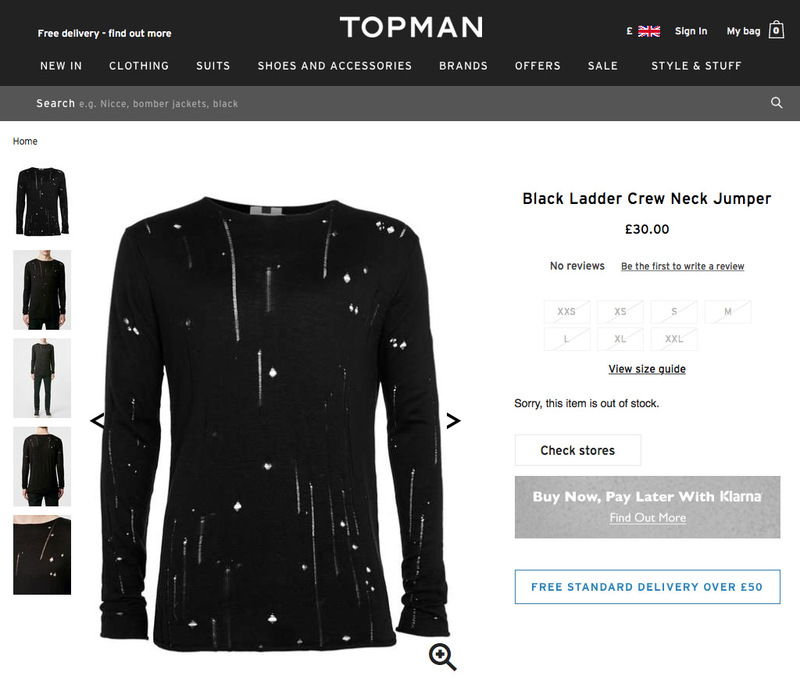 The jumper is an amazing rip-off of the Paul Smith original, but I guess it is sufficiently different to avoid a copyright lawsuit! 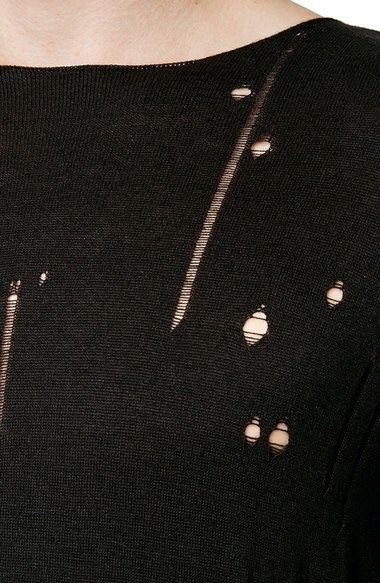 And here is a close up, showing the distressed holes a bit better. 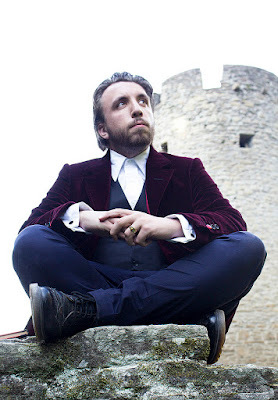 I’m kinda surprised no-one noticed it as an alternative the the Paul Smith shirt before it got used in Doctor Who itself. the US name for LADDERED! 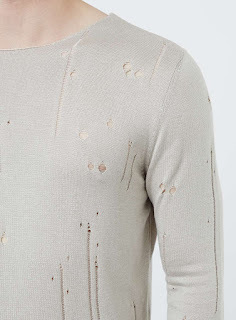 If you have missed out on getting your hands on the new hole-ridden jumper from Topman in the UK, there’s a chance you can still secure one - in the US! 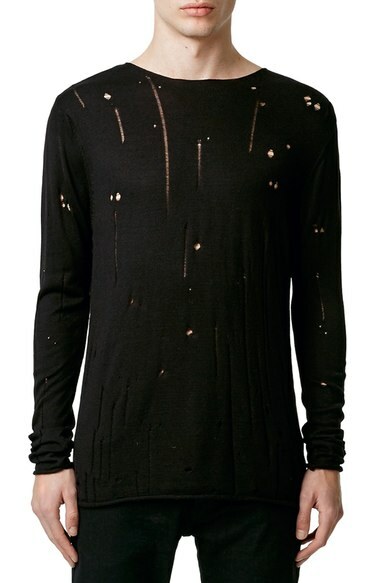 An America online reseller still appears to have stock - but just to confuse things they have renamed the jumper as the MOTH DISTRESSED LONG SLEEVE KNIT, as opposed to the original UK name, Black ladder Crew Neck. If you want to find one I suggest you act soon as they are likely to be sold out before you can say Raxacoricofallapatorious!!! I’ve been reading rumours that Peter is wearing a notable new jumper. 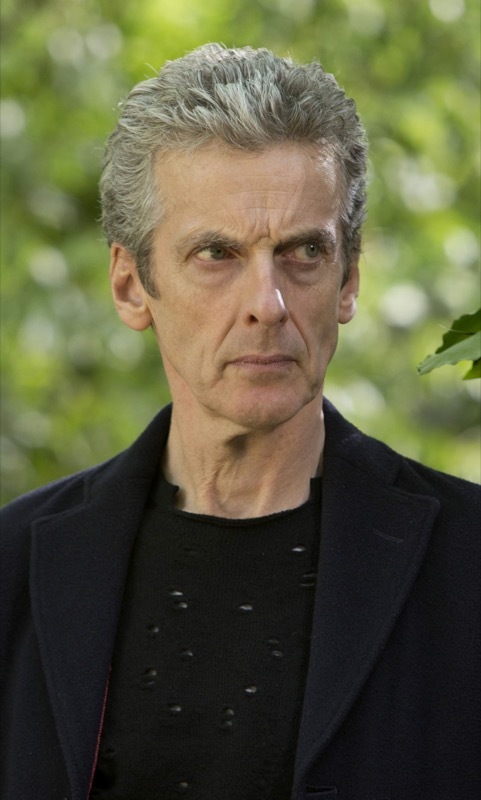 You may remember that from the middle of series eight Peter started wearing an ill-fitting and looking black jumper from Paul Smith. Full of designer holes it was well over £300 when bought new at their stores and having only been made in limited numbers, was quickly sold out. 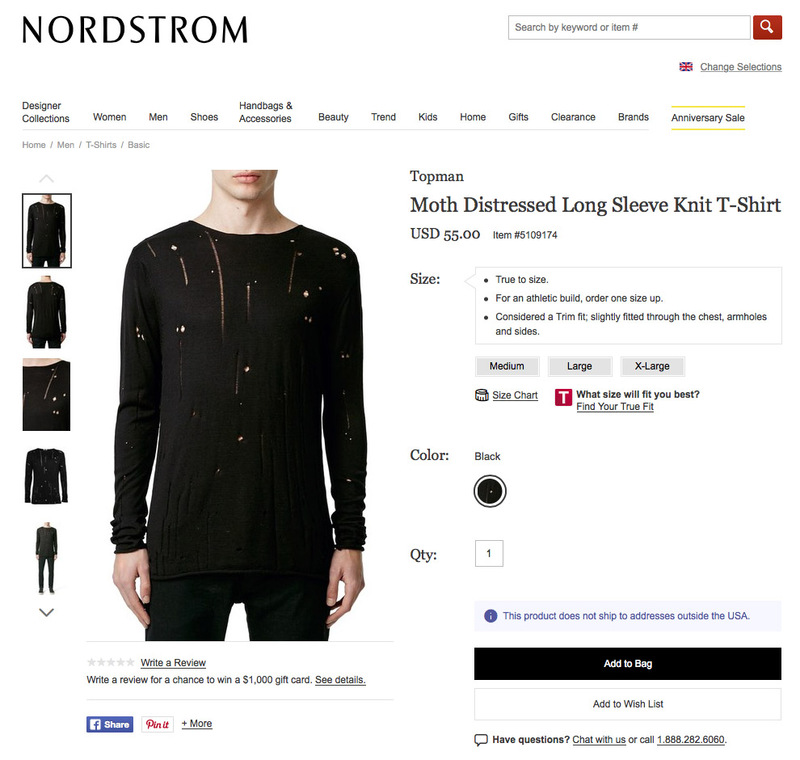 it’s not uncommon for other retailers to pick up on new trends and style and produce their own version of garments. This has been useful to cosplayers in the past when it has been possible to find cheaper versions of look-a-like garments in stores two or three seasons down the line. What appears to have happened is Topman have followed this pattern and made their own version of the Paul Smith jumper, calling it their Black Ladder Crew Neck Jumper, and it is this that has been picked up by Hayley Nebauer for the latest look The Doctor is sporting for filming in Valencia. I have heavily brightened the cropped image to the left so you can see the holes showing through the deep red t-shirt below. As is typical for new costume garments, the jumper is already sold out online, but I have been reading that in-store stocks are still around if you are willing to do the footwork to track one down. At the moment that seems to be the only option.